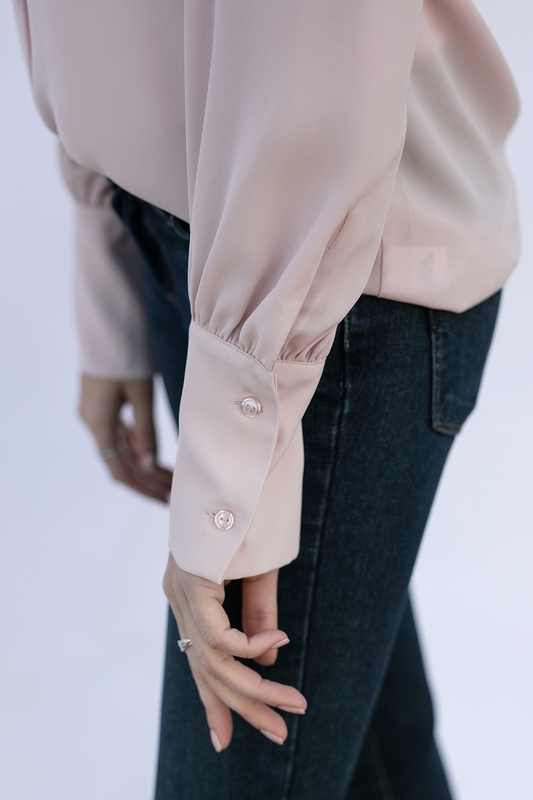 Due to the overwhelming positive response to the new Madison Blouse in Cream that debuted this past Holiday Season, we knew we needed to bring it back…and the most requests were for a soft pink tone that would work as another gorgeous wardrobe-basic hue. So, meet the Madison Blouse in Cherry Blossom! This lovely neutral tone will truly blend in and compliment nearly any outfit you need to wear, from office to evening events; the Madison is designed as an elegant, effortless blouse for any and all occasions. In a sheer polyester fabric that is intended to drape and fit loosely around the waist, it hangs gently and flatteringly over any body shape, with a great length that allows you to leave it untucked and flowing. It features a feminine ruffle across the front and back, graceful and elegant long cuffs with gentle gathers, long blouson sleeves, and a lovely ruffled neck. You can pair the Madison with almost any of our current, recent, and upcoming pieces, but more importantly the Madison is meant to inspire confidence in every woman as she embraces her beauty and strength!